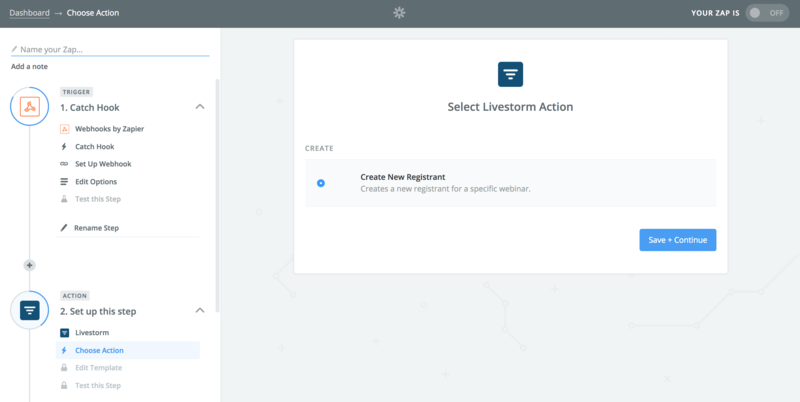 With Livestorm, you can use your own landing pages to capture new registrations. Typically, if you want to track certain events, have a custom form or a custom design, you will want to use your own landing pages. There are two ways to do it at the moment: via our Registration Widget or via our Zapier integration. Paste this code wherever you like (Wordpress, custom landing page, etc.). Pro tip: change the width attribute to change how fields are placed (if you need a column layout for example). If you choose to opt for Zapier, please make sure to collect consent from your registrants to use their data. This is required if you won't be using our registration page/widget. When collecting consent please don't forget to store the time, IP address and the exact text of the consent for future references. Zapier is a tool that allows you to connect web apps together. An integration between two apps is called a Zap. A Zap is made up of a Trigger and an Action. Whenever the trigger happens in one app, Zapier will automatically perform the action in another app. If you need to use your own custom HTML form, a Hubspot landing page, an Instapage landing page, or any other source, you must use Zapier to capture new registrations automatically in Livestorm. Zapier as a built-in feature called webhook. You can use them as API endpoints. A webhook is a URL to which you are going send your data. The webhook is like a recipient for data. Zapier provides webhooks to capture any kind of data and send it to a destination like Livestorm. Send some data in there and you're all set. Now, you can create forms and send the form data in that webhook. Then, all you have to do is create an action trigger with Livestorm. Why do I need to create a Zap per session? When you have multiple dates (sessions) you need to create a different zap for each date since the session cannot be set dynamically. However, you can mark the "Which Session" above as "Custom Value" and then find a way to send it to Zapier dynamically. You have two options: send it as a hidden field from your form or search it inside a Google Sheet like explained here. You can find the session IDs in the URLs on your dashboard, when you filter your webinar with one. In Instapage, you want to add a webhook as a destination for your form. We suggest you read this tutorial on how to set up Zapier for Instapage. Even though we have a native Hubspot integration, it works only to send data to Hubspot, not from Hubspot to Livestorm. So if you want to create new registrations from Hubspot to Livestorm you will have to use Zapier. When choosing a webinar to create the registration, you will have to set a webinar and a session. Even though session is noted as optional it is in fact mandatory. When the webinar is over, you can change the zap to create the registrant in a different session or a different webinar. Or you can create another zap.